The Cork team that lined out against the Kingdom in last year's Munster final replay. SIX CORK PLAYERS that started in last year’s Munster final replay loss to Kerry will miss next Sunday’s trip to Tralee to face the Kingdom in the Allianz football league. And another two substitutes who came on in that game will also be sidelined for the Austin Stack Park tie. James Loughrey, Stephen Cronin, Barry O’Driscoll, Alan O’Connor, Donncha O’Connor and Patrick Kelly will all be marked absent, after starting last July. O’Driscoll, the O’Connor duo and Kelly are all working their way back to full fitness from injury. Cronin is focused on captaining Cork in next Thursday’s EirGrid Munster U21 football final while Loughrey is away on his honeymoon. Fintan Goold and Conor Dorman – who came on as substitutes in that replay clash – are also still out injured. Cork boss Peadar Healy is also without another three players for the battle with Eamonn Fitzmaurice’s side. Full-forward Peter Kelleher is also unavailable for next Sunday’s game due to the U21 showdown while John O’Rourke and Noel Galvin are other Rebel players currently working their way back to fitness. Midfielder Ian Maguire, who limped off in last Sunday’s game against Down, did not suffer a serious injury and his fitness will be assessed later in the week. Former captain Michael Shields – who has only played one game so far this year in the clash with Roscommon – has returned to training and his availability will also be known later in the week. With a large number of players unavailable, the new Cork management has experimented this season with 16 players seeing action who were not part of the squad for that Munster final replay last summer. “We’ve unearthed fellas as a result,” says Cork selector Eoin O’Neill. 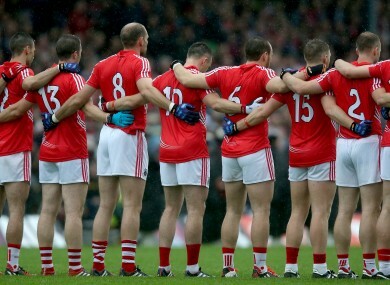 Email “8 Cork players who featured in 2015 Munster final replay will miss Sunday's Kerry rematch”. Feedback on “8 Cork players who featured in 2015 Munster final replay will miss Sunday's Kerry rematch”.